To register/add a new device to capture photos for your campaigns, first log into Admin Site (http://my.fotozap.com) with your master user. Select 'Staff & Devices' from the top navigation and drop down to 'Register New Devices'. Choose the promotion you'd like that device to shoot on and click the arrow under the 'Register' column. 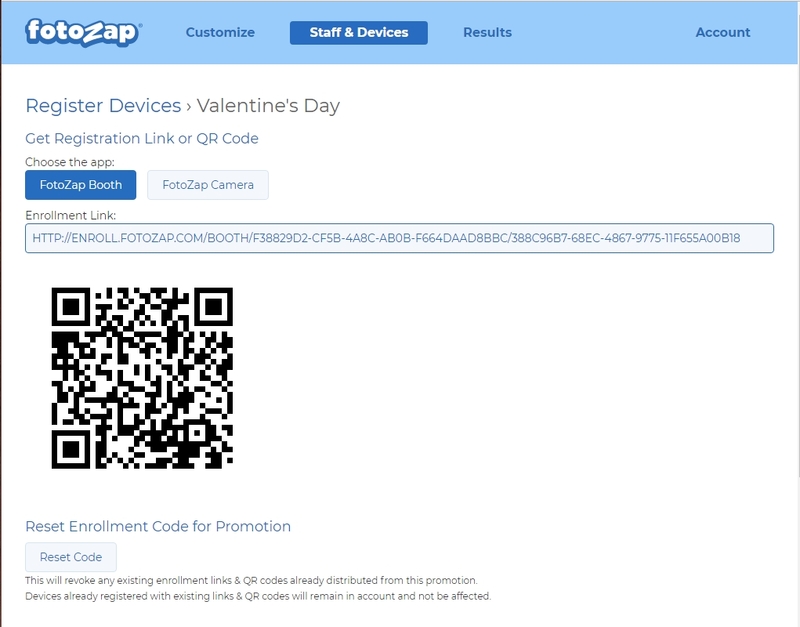 You will then see a page that gives you the choice of scanning a QR code with the new device or sending an Enrollment Link to that device (it's a long link so you'll want to send it via email or text message). Note there are options for the FotoZap Booth and FotoZap Camera apps. Regardless of which you choose all apps on that device will be updated with this new promotion registration. Once the QR code is scanned or the enrollment link is clicked, your app will launch already logged into your account and with the campaigns from the promotion you selected.